The early weigh-ins for tomorrow night’s UFC 210 pay-per-view took place beginning at 9 a.m. in Buffalo, New York this morning. Later today the ceremonial weigh-ins will take place beginning at 4 p.m. EST. 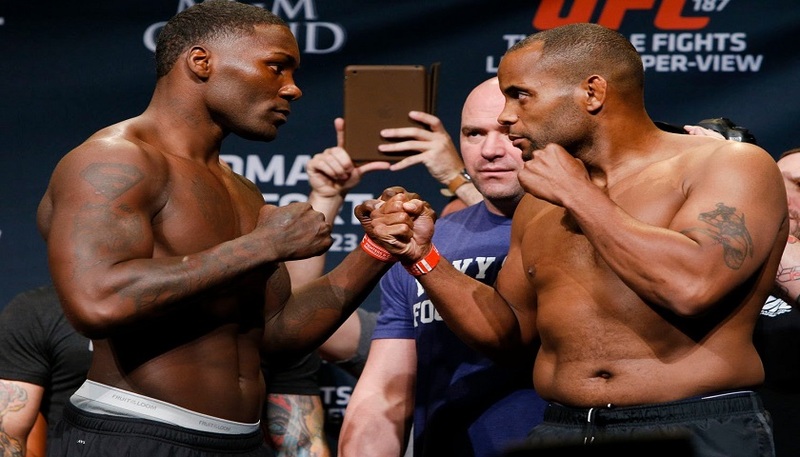 Tomorrow night’s main event is a rematch from UFC 187. Light heavyweight champion Daniel Cormier will defend his title against the main he defeated to claim the then vacant belt, Anthony ‘Rumble’ Johnson. What an unbelievable turn of events today as both main event fighters showed up just minutes to go before the weigh-ins ended by 11 a.m.
Cormier’s first attempt on the scale was with the assist of a towel and he came in over at 206.2 pounds. For a title fight a fighter must be on point, he or she cannot be over by a pound. Cormier walked to the back, came back and weighed in at 205 and the crowd went crazy. Then Johnson entered the room and made weight at 203.8 pounds. The title fight was saved but the tension was high. *** After weigh-ins the fight between Cynthia Calvillo and Pearl Gonzalez would be removed from the card due to Gonzalez having breast implants. Story here.